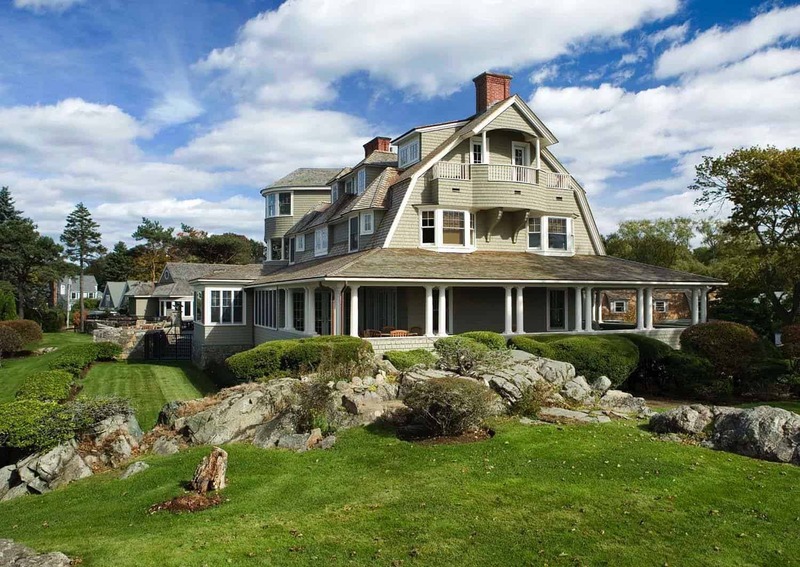 The beach style waterfront property was renovated to accommodate a blended family of eight by architects Siemasko + Verbridge, located in Marblehead, Massachusetts. 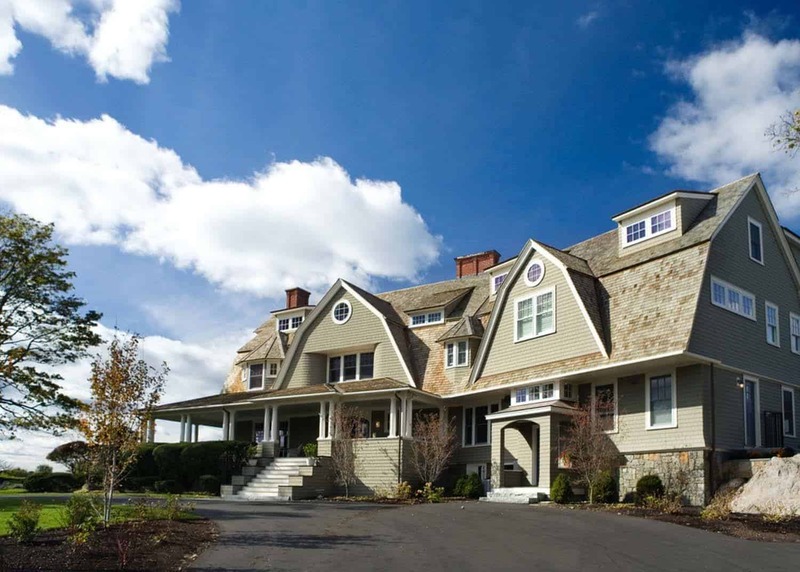 This main objective for the renovation of this 1900s home with a gambrel style roof was to preserve and highlight the character and charm of the original architecture all the while creating comfortable living spaces to cater to the lifestyle of this large family. 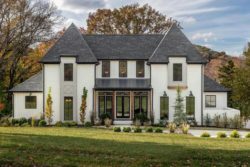 With spacious, light-filled living spaces and an outdoor environment that encourages spending time enjoying the great weather during the summer, this is one fantastic home. 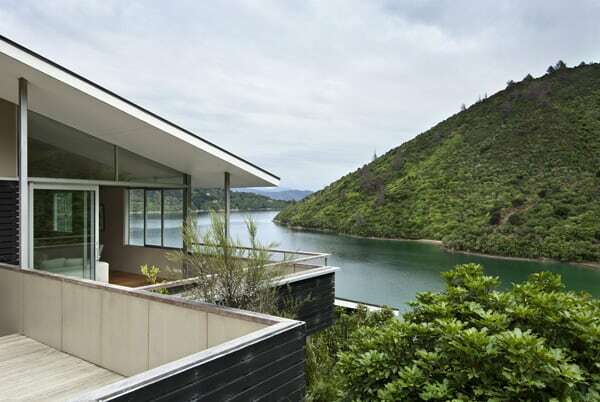 An expansive swimming pool comes complete with its own pool house, which is a showpiece in of itself and not to be missed! The finished product of this transformation is a fresh take on traditional style details with beachy elements mixed through, a very stylish home that is warm and welcoming and feels very lived in. 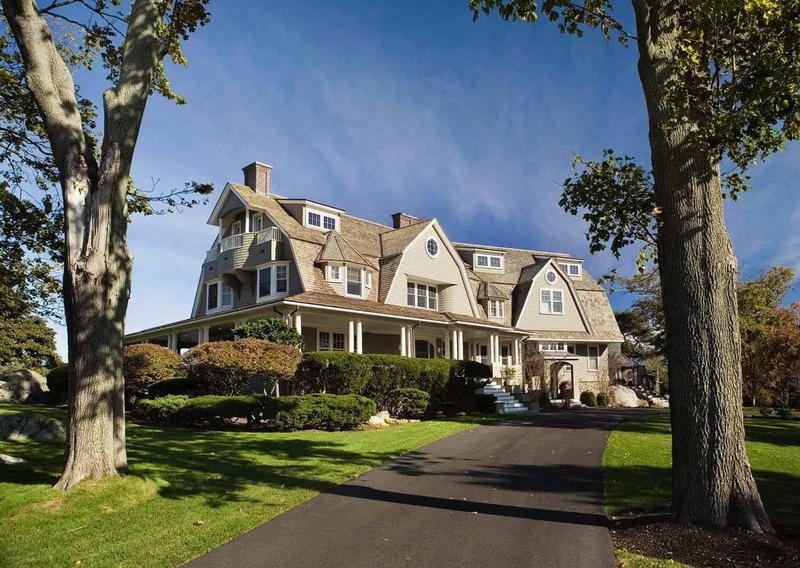 Step inside and enjoy the house tour! 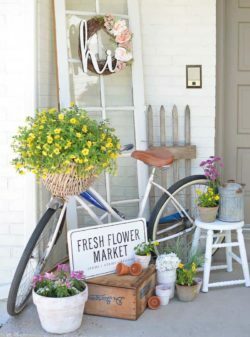 Up the front steps to the main entryway of the house, there is a wrap-around porch that extends all the way to the back of the home, adding to the charm of the exterior facade. On the left side of the home on the third story there is a private balcony off the master bedroom suite, we can just imagine the view! 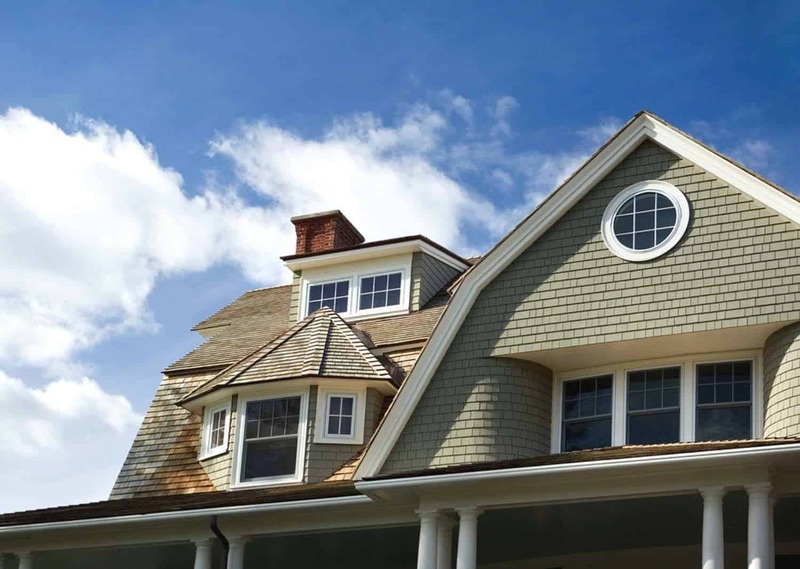 A closeup of the Gambrel roof shows just how beautiful this home is, both inside and out. 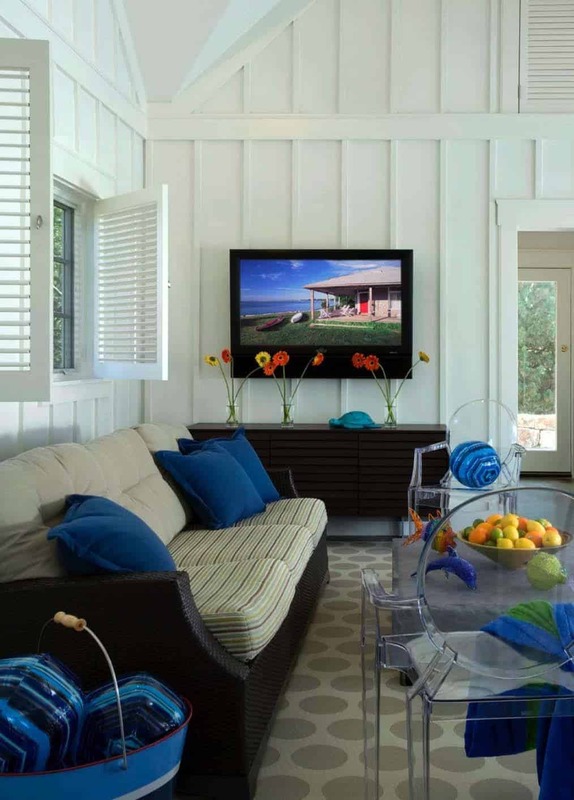 What We Love: The renovation of this property showcases a lot of amazing details, from the salvaged boat hull incorporated into the home bar to the beautiful master bathroom with luxe fittings and materials to the pool house… the perfect spot for six kids to have all day summer fun! 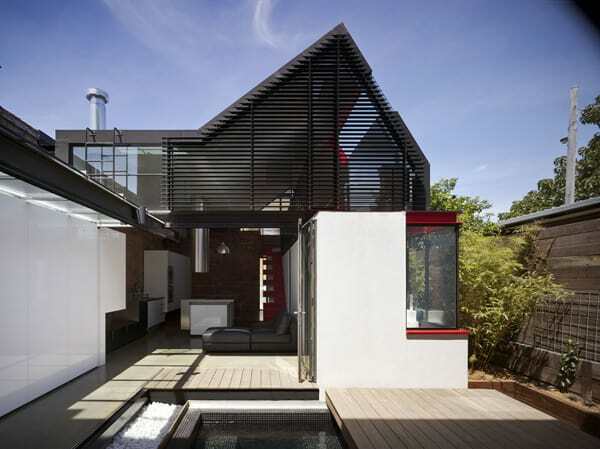 What do you think of this renovation project, did any one particular space stand out to you? Let us know in the comments below. 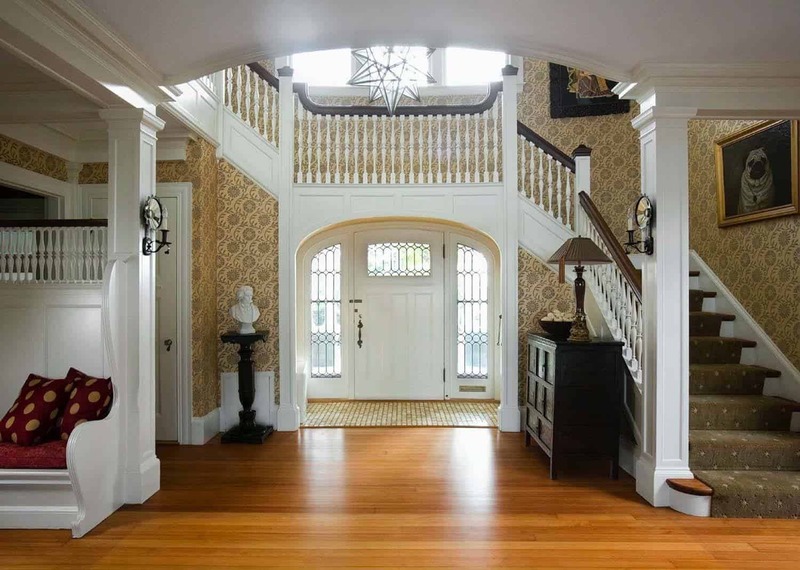 The foyer features a grand entrance, with red oak hardwood flooring gleaming from the sun filtering through the windows. Up the beautiful staircase (custom designed balusters) with a double height ceiling you will notice a gorgeous star pendant chandelier suspended in this space. In case you were wondering, the source for the stair runner can be found here. 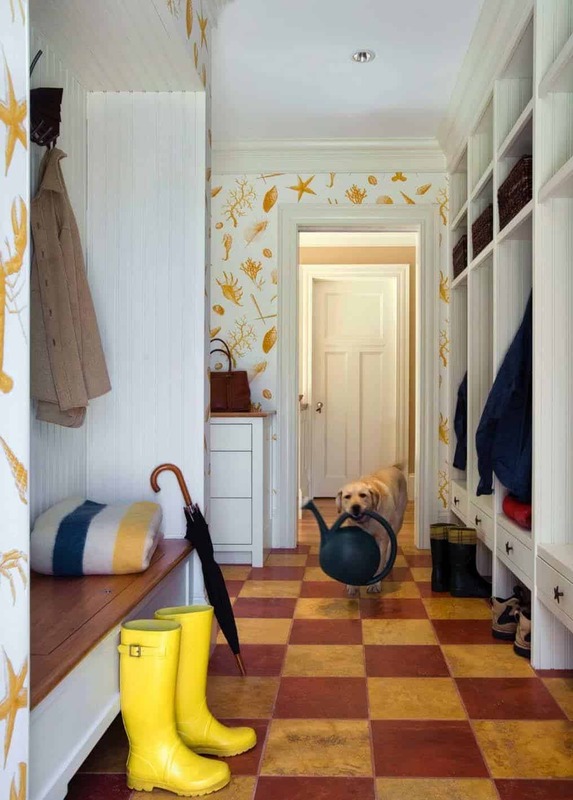 The mudroom was an addition to the home, a long walk-through featuring a custom built-in bench and individual cubbies for storing shoe, jackets, hats, mitts, etc. 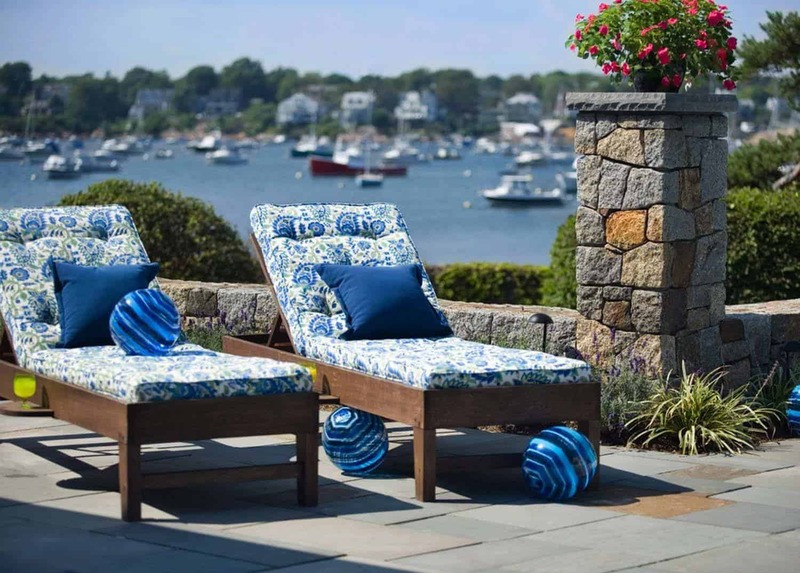 The fun beachy wall covering can be found at Clearance House. There is also a powder room in this space, but the laundry area is in its own separate area. 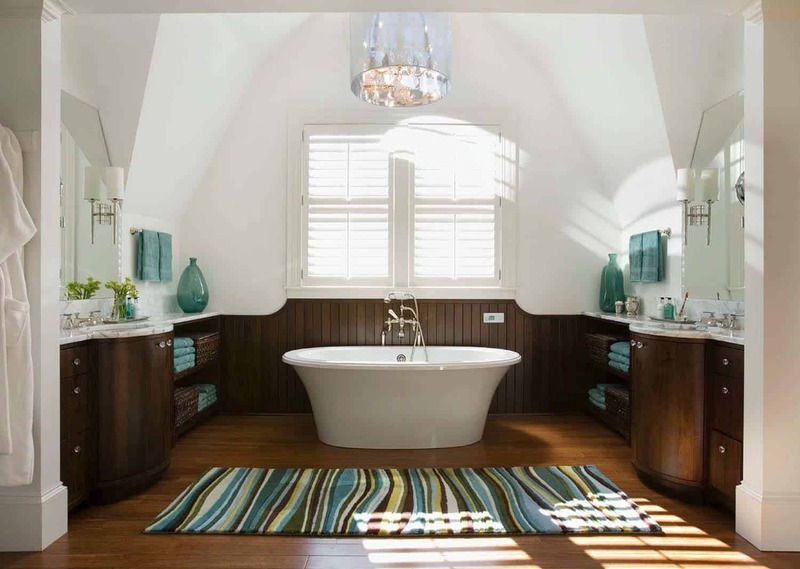 The master bathroom was given a complete transformation, with bright and airy interiors that are very beach-inspired. The beautiful chandelier above the freestanding bathtub is by Moooi, adding some luxury to the space. The bath mat is by Angela Adams. His and hers custom vanities as well as the wainscoting along the back wall are comprised of walnut, creating a nice contrast with the white Carrara marble countertops and white walls. The sinks are by Toto. 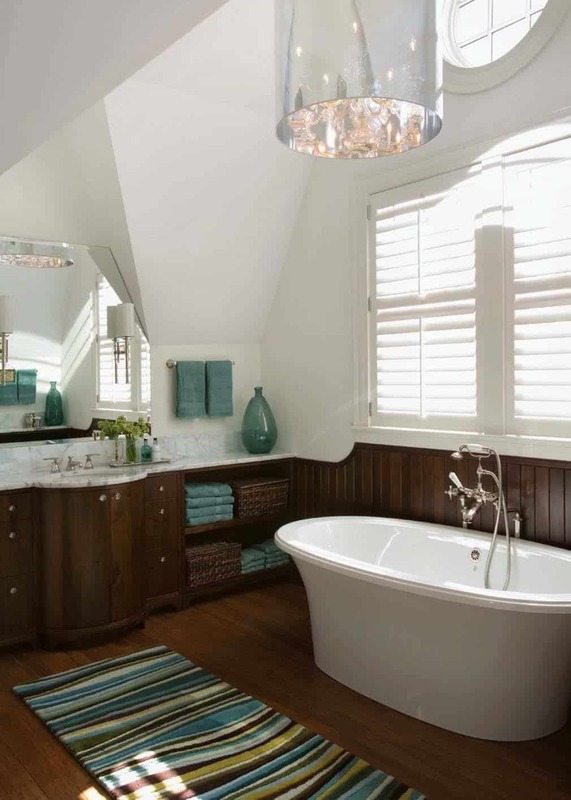 The finishing touch is the custom hardwood flooring, which some people would shy away from using in the bathroom because of moisture issues, but the use of hardwood in bathrooms is becoming increasingly popular. Please consult with a contractor on what woods work best in a bathroom before installing. The freestanding tub offers a spa-like feel with custom selected features that can offer complete relaxation and well-being! 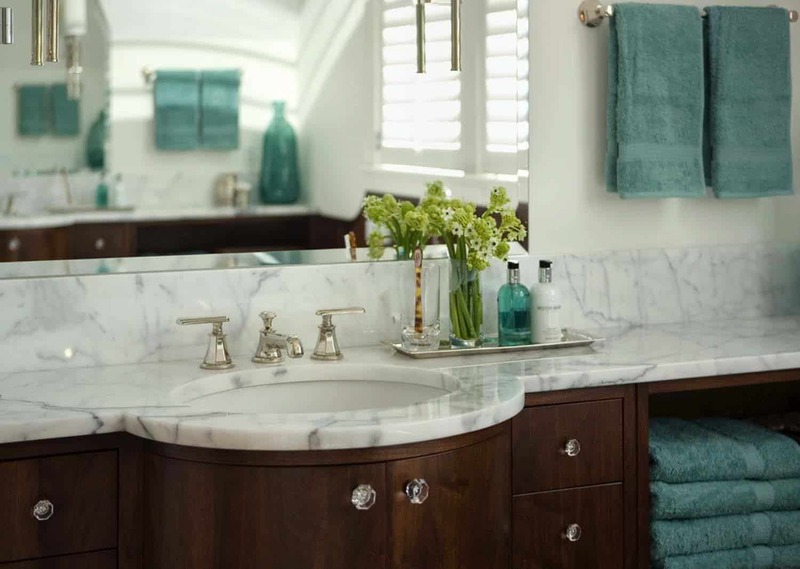 The traditional style sink faucets can be sourced from here, while bath towels can be found at none other than Bed Bath and Beyond! 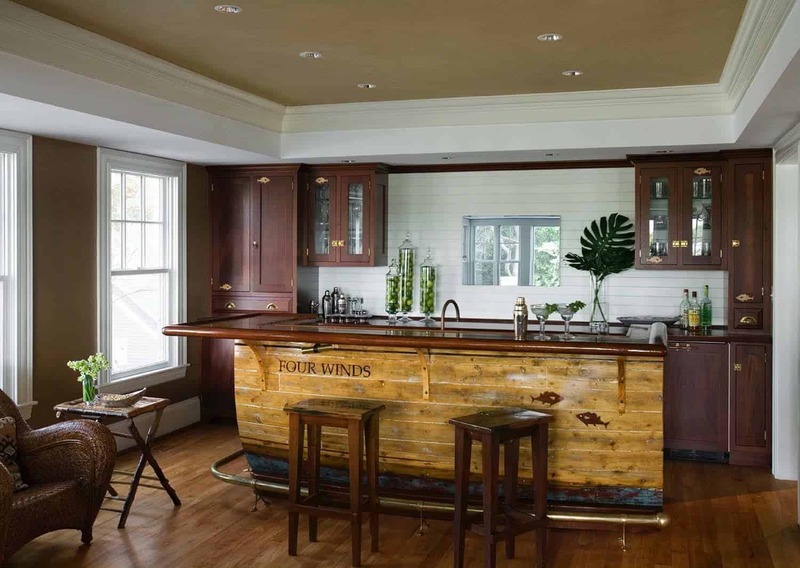 A custom designed home bar is in keeping with the beachy theme of the house. 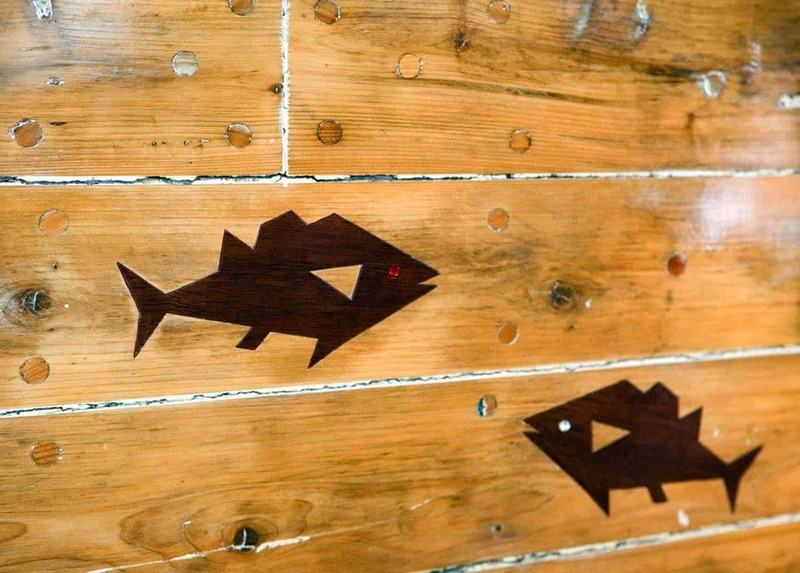 The bar itself is from the hull of a boat, completely salvaged and one-of-a-kind! 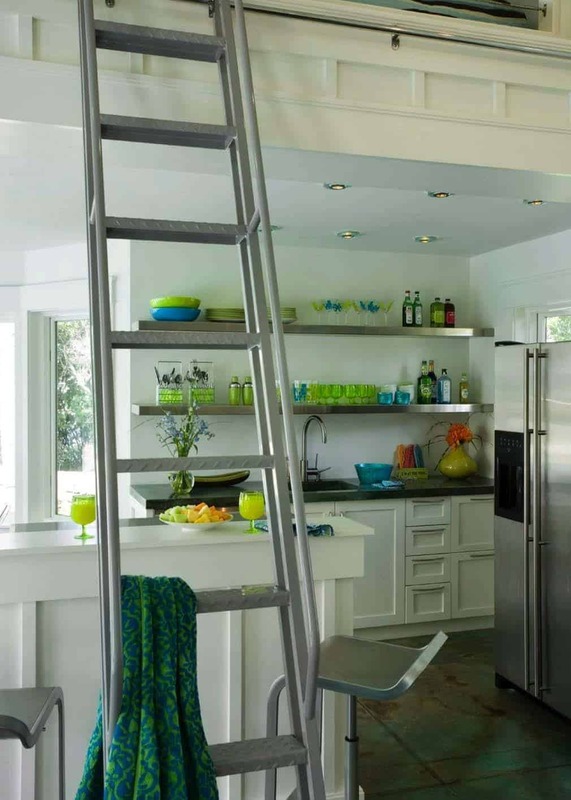 The bar itself is an island, where only the countertop material connects to the back of the wall. 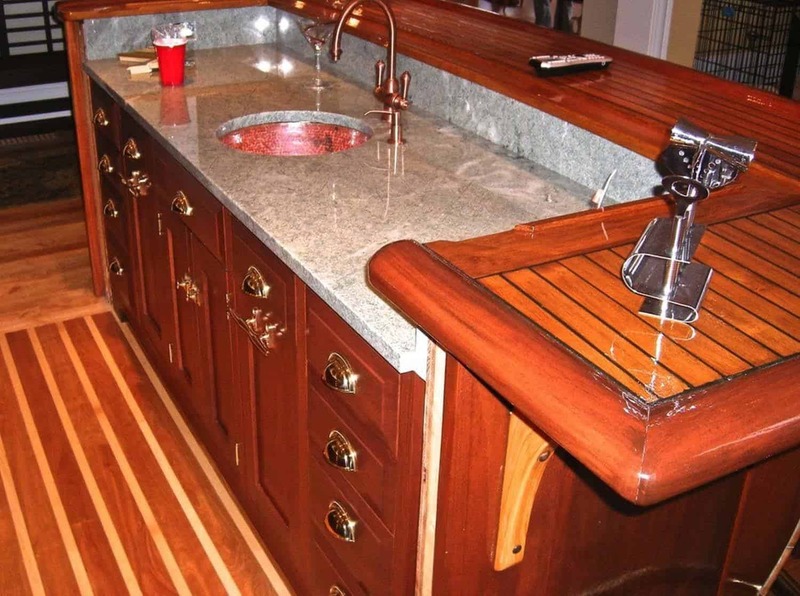 The hull was reinforced to the floor and shaped to make space for the wall of cabinetry behind it. This second entryway features a door that is original to the home, taken from somewhere else and refinished to fit the space. 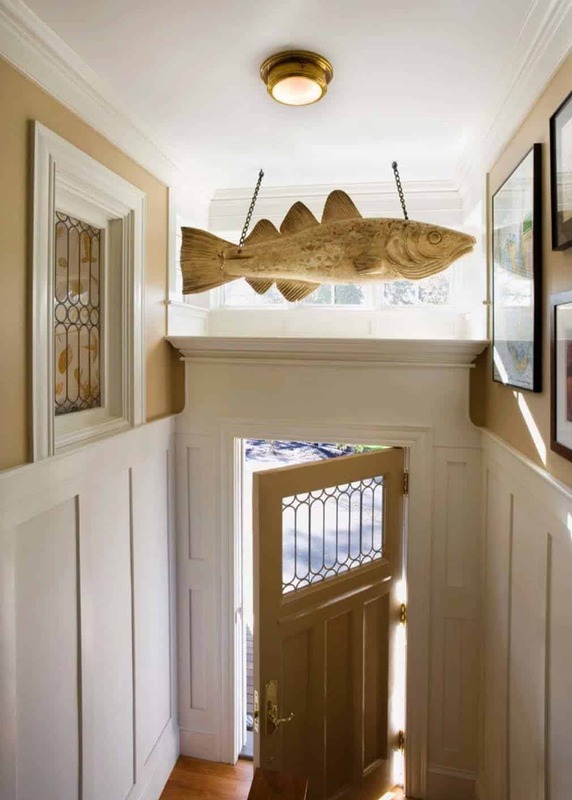 The homeowners already had the fish that is suspended from the ceiling, the design team had to find a clever way to showcase it… and this was it! 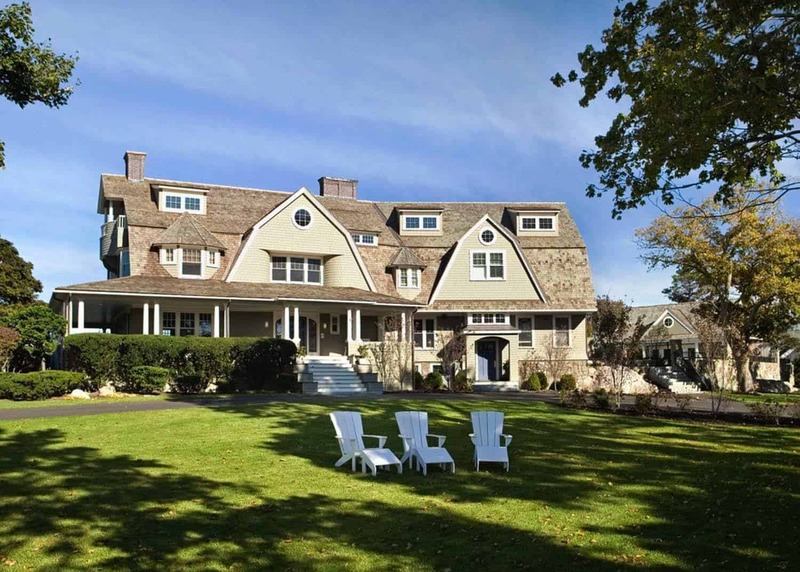 An expansive gunite swimming pool in the rear of the property features a beautiful pool house designed to match the exterior of the house. Lounge chairs nestle around the pool to relax and enjoy the beautiful property and fresh ocean air. 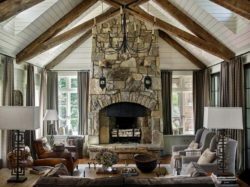 The pool house features an open concept living area and kitchen with a loft, with a total of 575 square feet of living space. 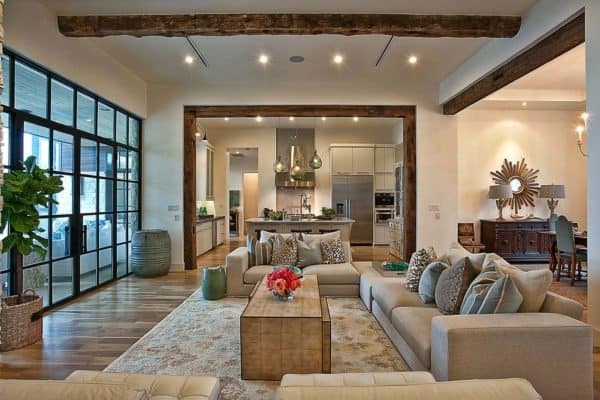 There an assortment of fabulous features in this space that we felt compelled to share with you, including the eye-catching capiz shell chandelier hanging over the dining table and a sturdy custom designed library ladder of steel with a powder coated finish which leads up to a loft space for overnight guests. The two armless chairs flanked around a coffee table were designed by Robert Cox and can be found here. The bright and colorful apple green fabric covering the chairs was selected from Pollack. 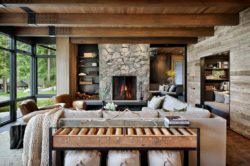 The comfortable sofa in along the wall in front of the coffee table, which plays double duty as an ottoman, can be sourced from Brown Jordan, who makes fabulous weather-resistant furnishings. The playful area rug is comprised of vinyl, sourced for durability and damp feet, designed by Landry and Acari…. and if you are really loving the fan, you are in luck, we have that source for you as well, you can pick it up at Matthews Fan Company. 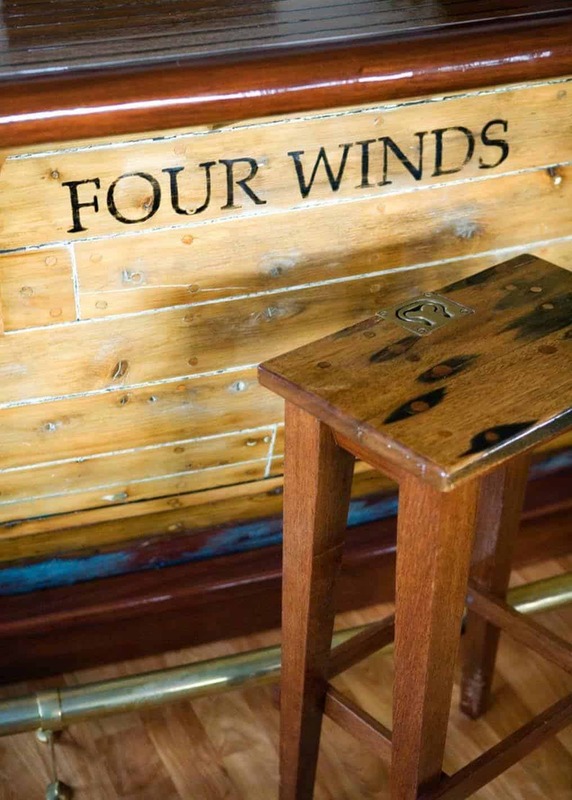 The last notable item that you may want for your home is the bar stools, which are very sculptural in style and would look great in many interior design schemes. You can find them at Design Within Reach, but shop around, this store can be a little pricey!